“Apart from many other cases I was also drawn towards a Chinese event I located that occurred in 1998 at a desert Air Force base, involving a Chinese Air Force F-6 pursuit. 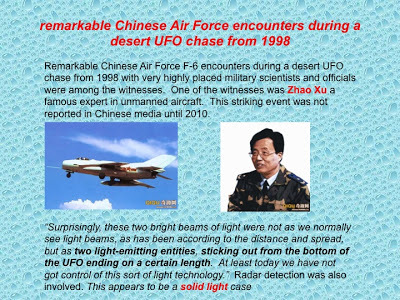 The possibly striking confirmation of Zhao Xu, who is described as a famous Chinese Defence expert in unmanned aircraft, as one of the various high level witnesses, who mentioned "Surprisingly these two light beams of light were not as we normally see light beams, as has been according to the distance and spread, but as two light-emitting entities, sticking out from the bottom of the UFO ending on a certain length. At least today we have not got control of this sort of light technology." Radar detection was also involved. Given this comment was made by a defence specialist I suspect some Chinese military science investigation and research since then. * Correction: following further research and more detailed translations the quote above referring to "two light-emitting entities" comes from General Li the PLAAF missile base commander in the Badain Jaran Desert in Lanzhou province. Major General Zhao Xu witnessed the UFO incident. It was General Li's pilots who undertook the attempted aerial pirsuits and close up observations. karl12, whats your relation to the professor from biggeststtudy blog in your link ? Hola Milo, appreciate the direct question mate and there isn't one - lots of respect for the Professor though and he seems to be one of the few UFO researchers out there providing consistent (and extremely interesting) information. -you're not wrong about attempting to be objective and courteous though and I suppose being the opposite rarely gets you anywhere. All I've read is the news report for this Brazilian light beam case from the village of Aracariguama in 1946 so I don't know if you're aware of any more info but it doesn't sound like a very pleasant one as it states the victim's nose and ears fell off! Ufo's appear to be able to control energy in forms that are not well understood in our time. One type of energy that is often observed is an intense beam of light which is emitted from a ufo. The purpose of these beams is still a mystery. One might venture to guess that they are used for scanning purposes, or perhaps as a means to tap sources of energy that are deep within the earth itself in quartz veins. Recently a man on a walk in rural Pennsylvania encountered a ufo in the woods that was pulsating brilliant red and white colored lights. As he watched in disbelief, the ufo emitted a beam of light that he described as being " a very intense brilliant blue-white light that was emitted from the bottom of the object". This light beam went from the ufo all the way to the ground. He describes it as such: " This beam did not diffuse with distance, but was a tight, bright beam from top to bottom." There is another account that occured in the early 1980's made by four boys from Vancouver, B.C. These boys recalled an encounter with a ufo as they walked along a road near their subdivision. This ufo was also flashing multi-colored lights and was moving slowly above the tree line of a wooded area. Suddenly, a blue beam shot from the ufo and went directly between two of the boys. All four boys dove for cover into a nearby ditch until the ufo left.. The May, 1953 issue contained a most unusual one from Mrs. A. M. King, of P.O. Box 2162, Nairobi, Africa. While enroute to Capetown on the S.S. Llandovery Castle at the end of June, 1947, Mrs. King observed a spectacular sighting. It occurred at approximately 11 P.M. The object was sighted as the ship was going through the Straits of Madagascar. "We noticed a particularly bright star. It was traveling very fast and approached the ship. Suddenly; a searchlight appeared which flashed a strong beam of light on the water within 50 yards of the ship. It descended, its beam shortening and becoming brighter as it neared the water, and the next instant there was no more light, but an object appeared, apparently made of steel and shaped like a cigar cut at the rear end. It remained in the air about 20 feet above the sea, parallel with the Llandovery Castle, and traveling in the same direction. 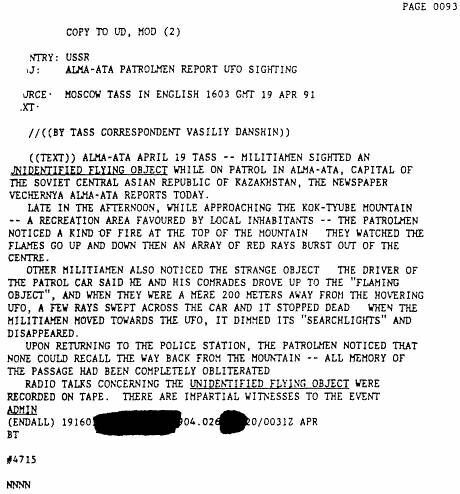 USA intelligence report involving multiple Police witnesses and a UFO 'emitting rays' from the USSR in 1991 (even though the U.S. Government deny taking any interest whatsoever in the UFO subject since 1969).